Where we discuss the behavior of our hermit crabs, as in fights, pecking orders, shell swaps, etc. Please post all naked-crab posts in the Emergency forum. So last night I heard some weird noises and shells scraping against the glass but when it started to sound like foil being touched I went to check it out. I kid you not, my biggest crab climbed up and out of my cage and was walking on the hecking roof. I didnt know this was possible, but my hermit crab is an absolute god. Wow, if you are thinking it is the lid I think using clips or putting weight on it might help. 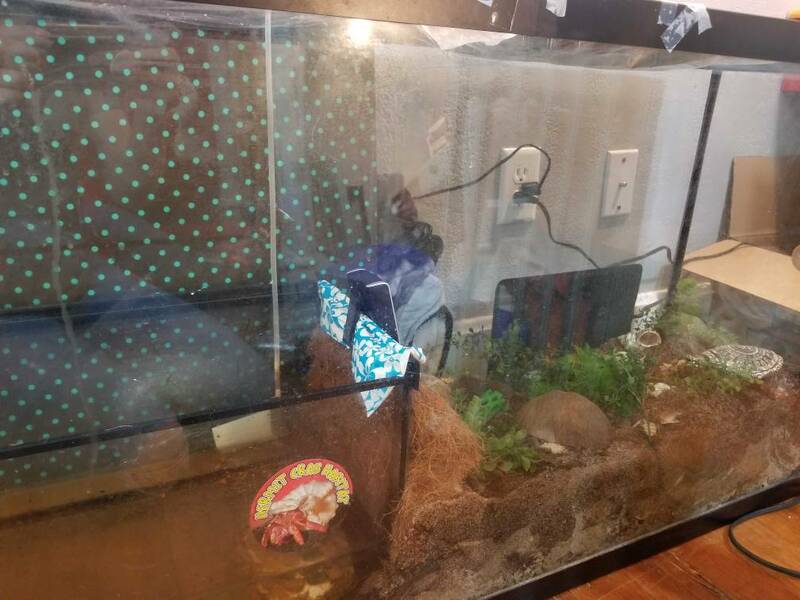 I caught my crabs climbing up air tubes, wires for the temperature probes and wahever else they can get their legs around. I heard smaller crabs can even climb the caulk in the corners of the tank. Every once in a while I will see a crab climbing on the hinge area of the lid too. Some people duct tape their lids down to prevent a wild crab in the house. They can do some crazy things! I had Rod on top of my analog gauges once, there was absolutely nothing for her to climb up to get on top of it, but she did it somehow. I think she was trying to tell me she didn’t like those old analog gauges either. my crab climbed up the climbing branch, JUMPED on to the plastic plant hanging from the lid to provide shade, and climbed up that and hung upside down on the lid. he was so scared! my dad had to help me get him down by sticking his hand a couple cm under the crab in case he fell, and i had to coax him to the plant, and he climbed down. there was a close call when he slipped, but my dad caught him while i was keeping the lid up so he could put his hand through, and my other hand was holding the branch to keep it sturdy. dads are awesome sometimes! and after all that, the sneaky little guy just went up the same branch and sat there. we eventully removed the plant for safety purposes. and the name of this little booger is... acorn. He was most likely not scared at all, crabs climb on the lid all the time and they rarely need human help unless they appear to be struggling to hold on, and if they do fall it won’t hurt them at all. but you are probably right! i will keep that in mind. They're also called tree climbers. Because they climb trees in the wild. 30ft trees and drop at times, pretty much unharmed.